From numerous soundtrack reissues and questionable spin-offs like Christmas In The Stars to miscellaneous releases like 1977’s gold-selling The Story Of Star Wars, the Star Wars franchise is no stranger to record store shelves. But that wasn’t enough for digital artist Steven Lear. At his incredible, eye-deceiving site, Why The Longplay Face?, Lear mashes up classic album covers with classic movies with great wit. Jack Nicholson from The Shining, for instance, might find himself adorning a Human League record, while the hit men of Pulp Fiction might don turtlenecks and pose as Simon & Garfunkel. If Lear has a specialty, it’s creating alternate universe albums with characters from Star Wars. 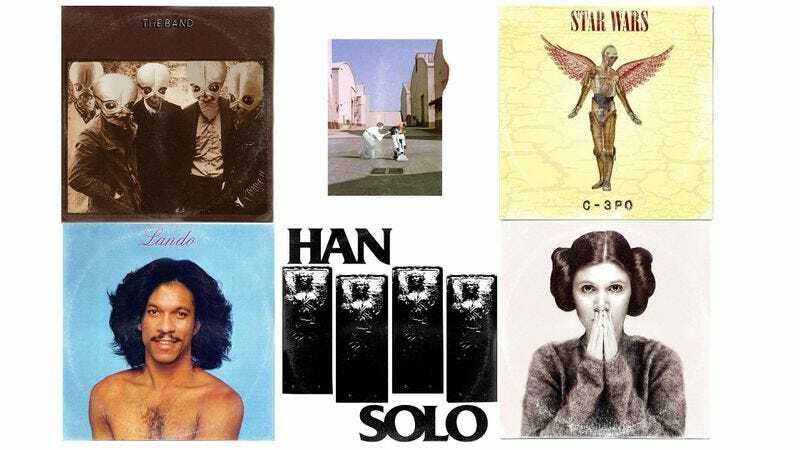 This is what music history would have been like if the various Wookiees and droids from the George Lucas-created space saga had ventured beyond the perimeter of the soundtrack bin and infiltrated every other genre of popular music, from punk to funk. In addition to his own site, Lear’s work is available through Facebook and Instagram as well. A typical post on the latter shows the artist’s take on the cover from Blur: The Best Of, which is already a variation on Queen’s Hot Space album. As is typical of internet humor, references nest within references here. One interesting thing Lear has been doing on his Facebook account lately is posting a series of comparison photos in which his creations are juxtaposed with their inspirations. Wouldn’t Björk’s Debut have been even more fun if it had been recorded by Princess Leia instead? Lear isn’t above having some fun with characters’ labored breathing. And he casts some aspersions on their intelligence as well, via Iggy Pop. Some of these covers may be considered disturbing, especially for anyone who didn’t want to know what Yoda had going on underneath that shapeless robe of his. Ultimately, it’s all worth it for such fine images as the following cover, in which Billy Dee Williams’ super smooth personality comes to the fore. Works every time. Bonus points for convincingly replicating that halo effect that album covers tend to get over time.